Camro is strategically positioned within Cambridge’s hub of science and technology, a centre of excellence for high tech businesses and the leading tech area in Europe. Cambridge is steeped in history and has produced some of the world’s greatest minds including Charles Darwin and Isaac Newton both of whom were educated at the world-renowned University of Cambridge, consistently ranked as one of the top five universities in the world. The City’s easy accessibility via a range of transport links, its skilled workforce and pool of highly educated graduates, quality of lifestyle and close proximity to London make it an exceptional location. 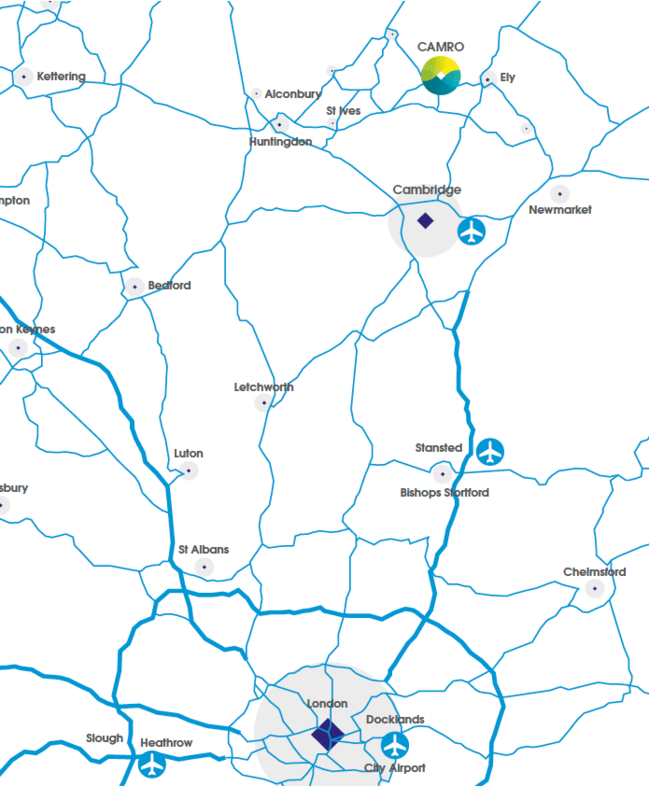 Located off the A142 to the west of Ely, Camro provides easy access to Cambridge, London and international travel hubs in a highly secure, low risk location which is ideally suited to provision of cost effective mission critical facilities. The M11 and A1(M) motorways provide fast routes south to London and to the north. Average journey times to London by car are 1 hour and 30 minutes. London (75 miles to London Docklands E14). London Heathrow (87 miles) has an average journey time of 1 hour and 45 minutes. London Stansted (47 miles) has an average journey time of 50 minutes. London City Airport (75 miles) has an average journey time of 1 hour 30 minutes. The London to Cambridge service is frequent and takes between 46 minutes (from Kings Cross) and 1 hour and 30 minutes (from London Liverpool Street). Nearby Huntingdon and Ely are equally as accessible from London, with trains taking approximately 1 hour and 45 minutes. 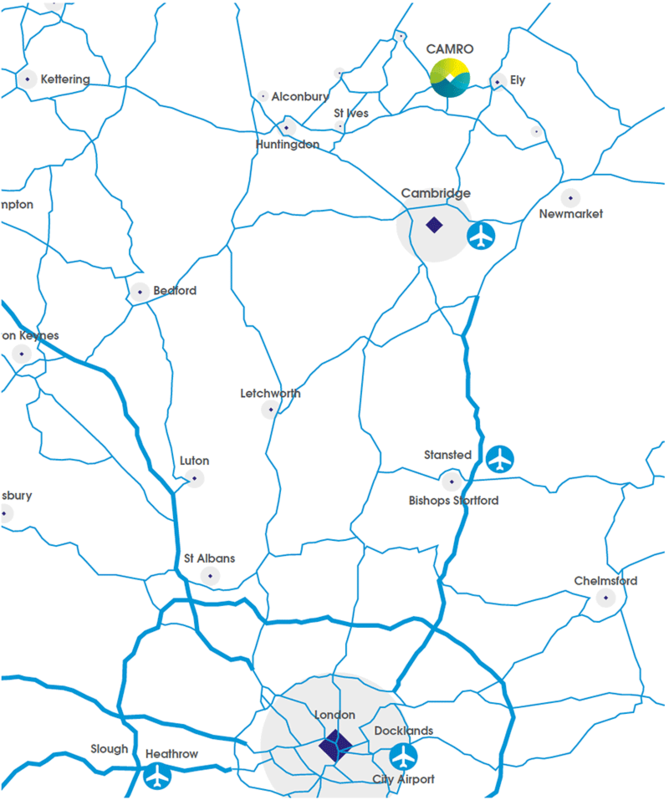 International commercial hubs including Heathrow, Stansted and London City are easily accessible, Executive air services are also available at Cambridge Airport 18 miles to the east of Cambridge.